Click Here to read Volunteer Blog Story! Happy New Year from Education Plus Executive Director Monica Loveley and Intern Keeley Walsh! We are thrilled to start 2014 with the happiest news we’ve ever had to share. Christmas 2013 was for sure the highlight of what has been an amazing year of growth for Education Plus and the children we serve. After months of fundraising, planning, and organizing, weeks of identifying uniform and shoe sizes, and hours in Managua’s Oriental market, everything finally culminated with our Christmas events on December 24th and 25th. We finally began to see our hard work pay off on the morning of the 24th as we moved backpacks full of school supplies and gifts for 98 students, 39 of their brothers and sisters, and 2 entire families to the school in Pantanal. Even though we had told the children to arrive at the hour their normal class times, the whole barrio seemed to be there before the first class had even begun. The day was full of joy and surprises as the kids opened their backpacks to find school uniforms, new shoes, notebooks, colored pencils, pens, stickers, pencils, scissors, pencil sharpeners, blankets, pencil cases, cups, story books, clothes, coloring books, art supplies, socks and much more. The way the kids walked out of the room with their new backpacks on their back and proud grins on their face really said it all. Thanks to our generous donors we were also able to provide Christmas presents for 23 girls from an orphanage in Granada, as well as 50 children from another program at the other end of Pantanal. All in all, we were able to provide something for Christmas for over 200 children! Thank you sponsors!!!! Those of you who sponsored individual children will be getting personalized e-mails with photos as the kids finish their thank you notes this month. December 25th started out the way it always has in Pantanal – the streets empty, silent and dusty. However, by 1pm the party company and volunteers had arrived and the children of Pantanal were lining up behind brinca brincas (or bouncy houses) as they were inflated. Jim noted how the behavior of our kids had significantly improved from last year as they patiently waited in line; most likely at least in part due to our program, which encourages behavioral improvement by providing structure with both consequences and rewards. 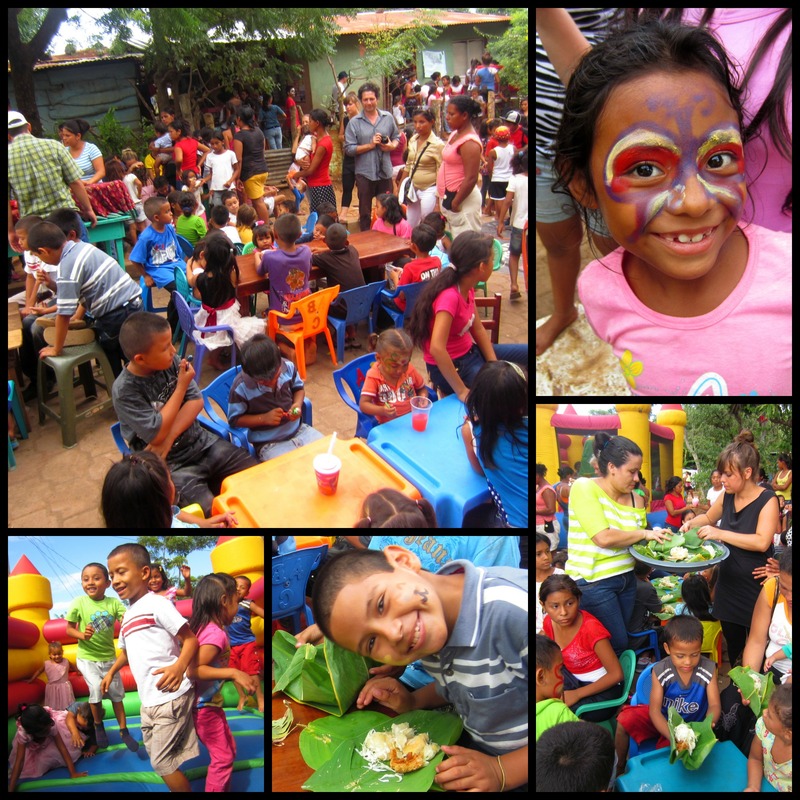 The party included music, dance competitions, four piñatas, two bouncy houses, face painting and was full of excitement! Vigoron (a traditional Nicaraguan meal), cotton candy, and popcorn were served for 300 people, with over 500 community members attending the party throughout the day and beverages provided for all. The fiesta was definitely one of the highlights of our children’s lives and was made possible thanks to your support and a huge contingent of Christmas volunteers! Thank you all so much for making these amazing things happen for the children of Pantanal. We look forward to sharing even more smiles and successes with you in 2014! 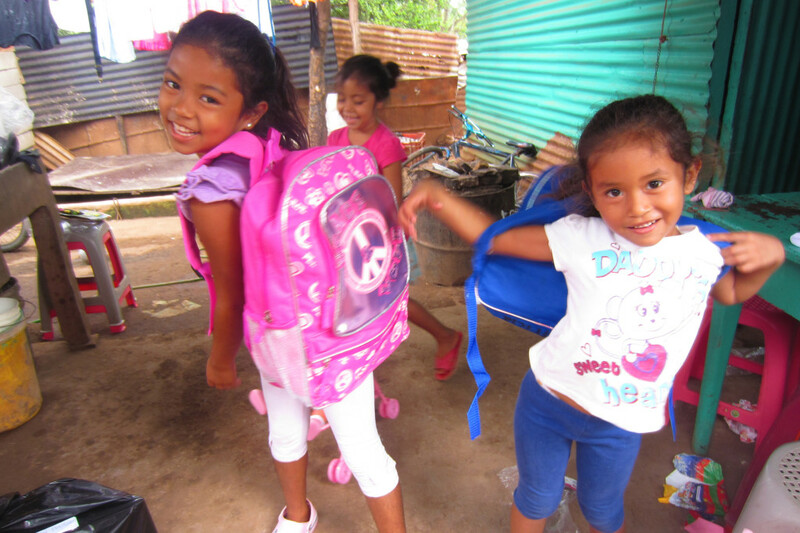 Girls with their new backpacks! Over 100 students received backpacks from us for Christmas this year. and activities in order to eliminate malnutrition, instill core values, and give them the resources and opportunities they need to rise above their impoverished circumstances. © Copyright Education Plus Nicaragua 2015.